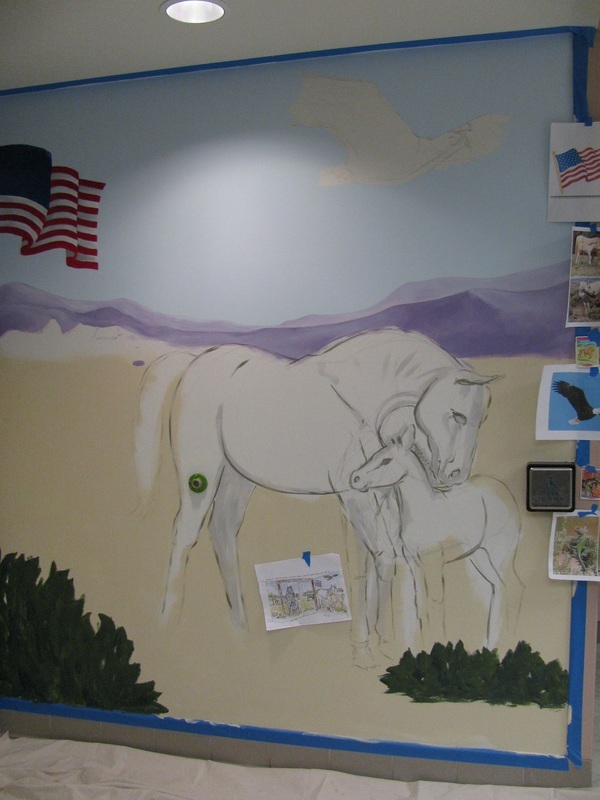 Colleen felt honored to be commissioned to design and paint this large Pediatric clinic that serves soldiers' families at the Army Base at Fort Lee. 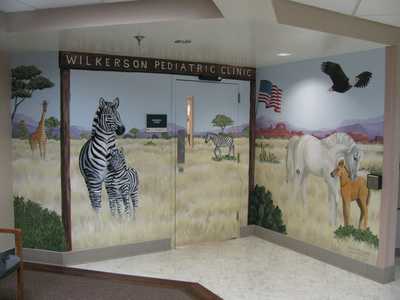 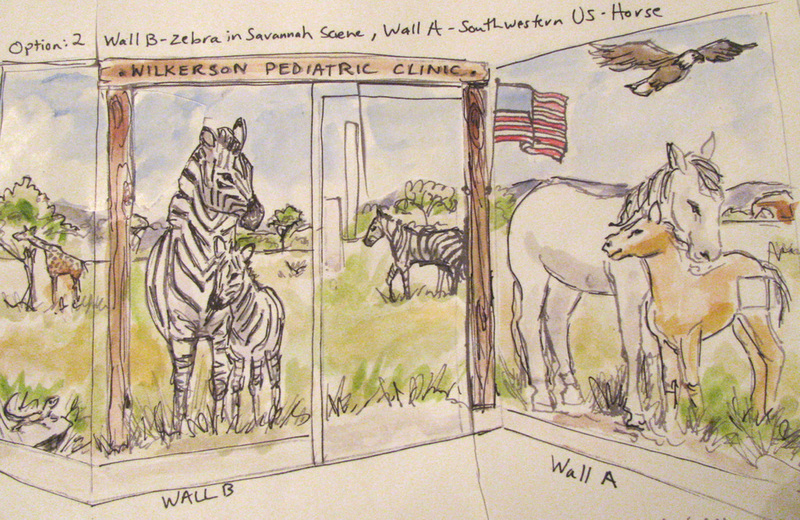 The clinic was set up with two teams of physicians and nurses - one with a horse mascot and one that had a zebra. 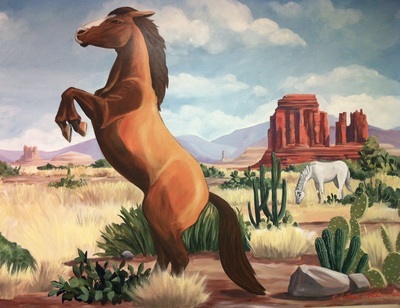 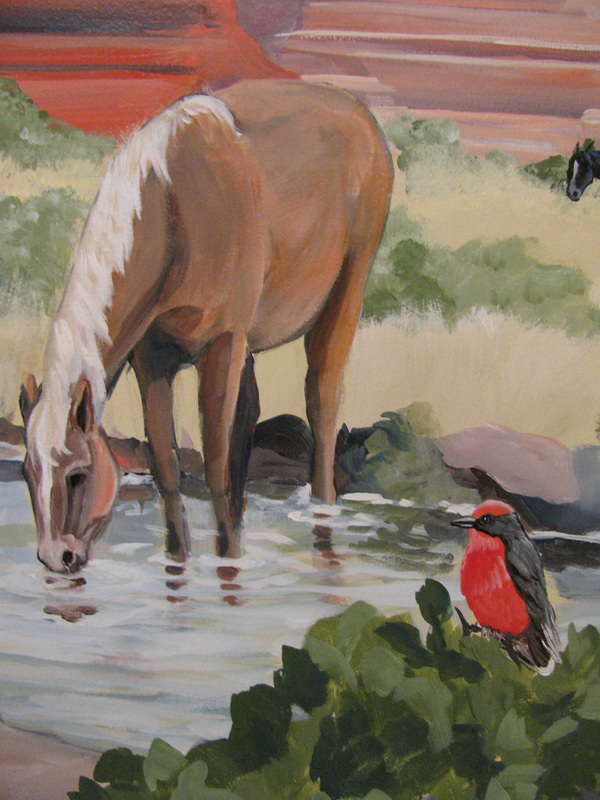 The equine nature of both helped to give a unifying theme. 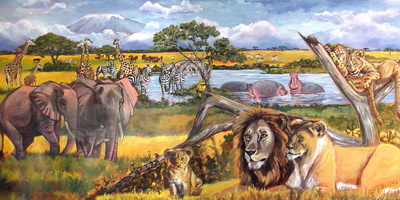 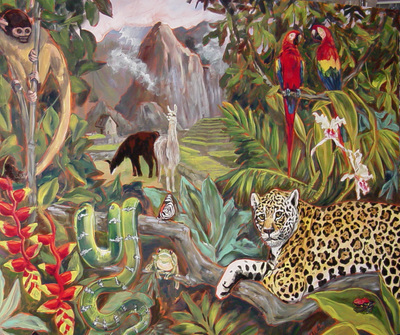 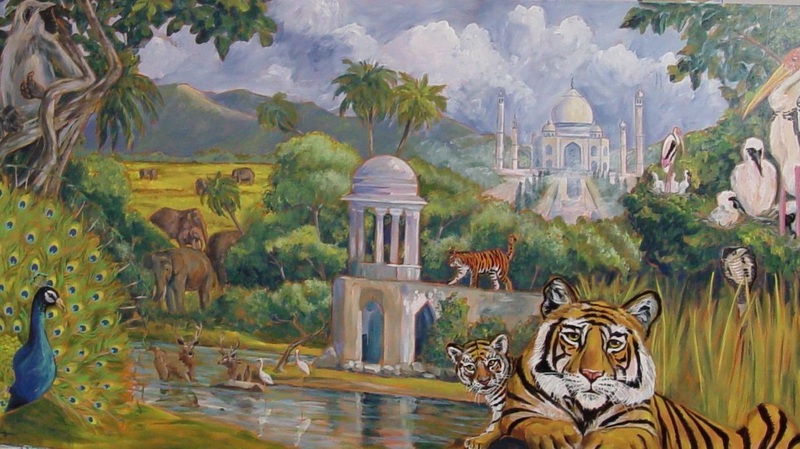 Naturally, the environments for each mascot had to be very different, from the colorful buttes and landscapes of the American Southwest to the golden Serengeti Savannah of Tanzania. 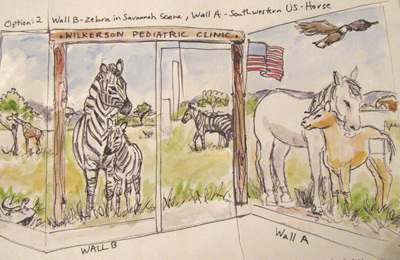 As an artist, Colleen enjoyed dissecting the physiological differences in the anatomy of rendering horses versus zebras. 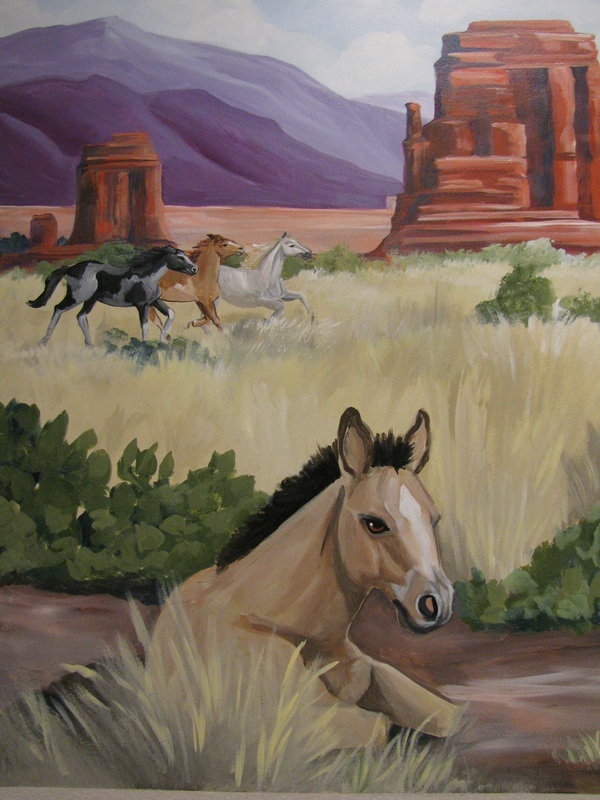 While she had painted the African savannah before, she really enjoyed diving into the cacti and unique colors and landscape of the Southwest. 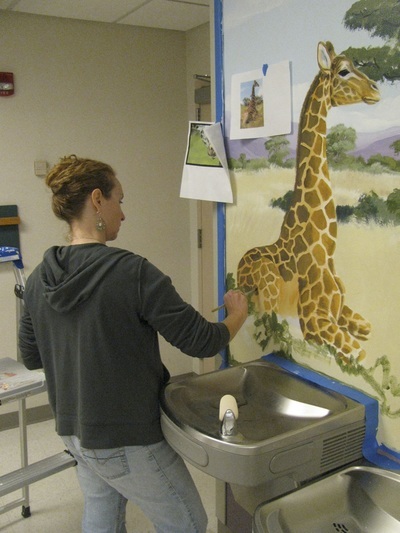 Colleen also felt proud of herself qualifying for and negotiating the nuance and alphabet soup of her first large government contract! 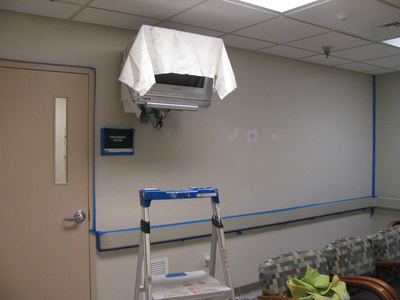 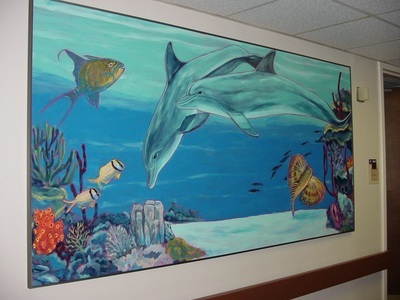 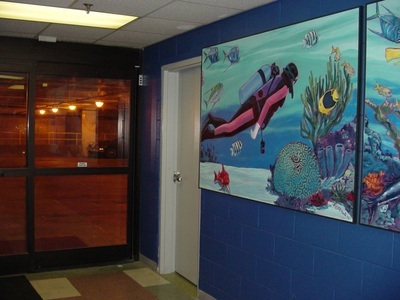 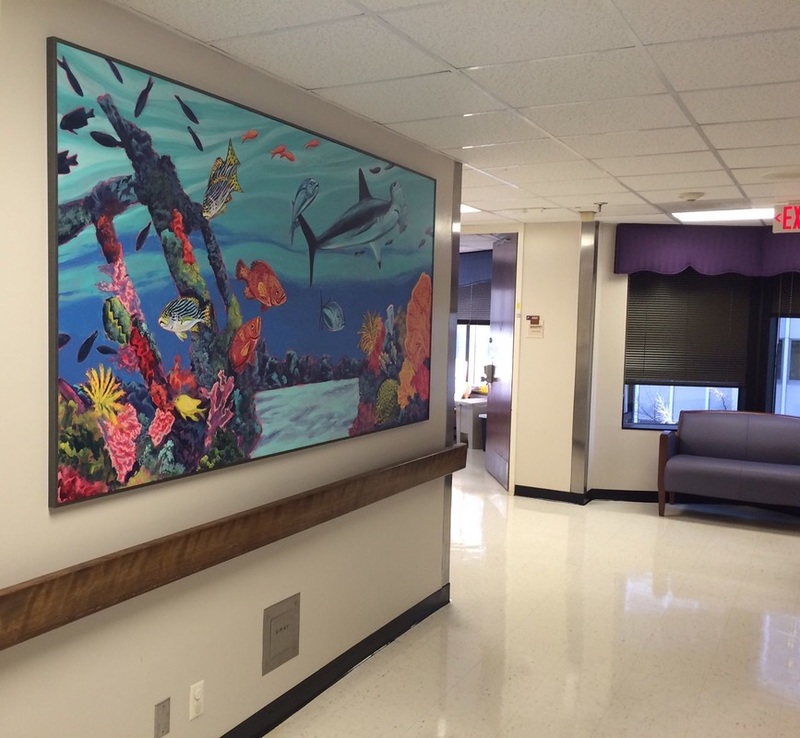 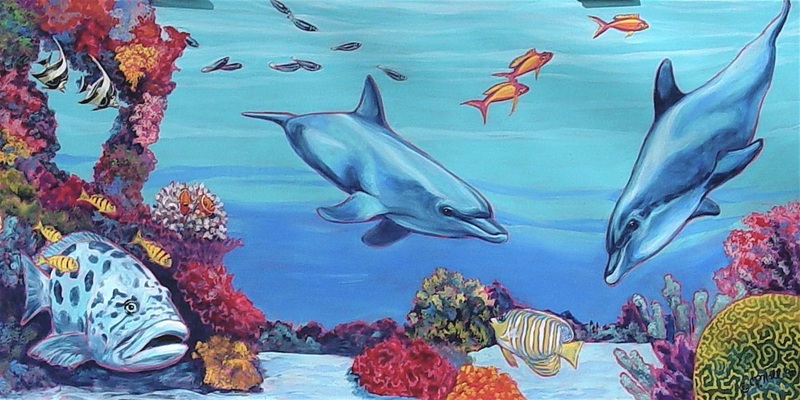 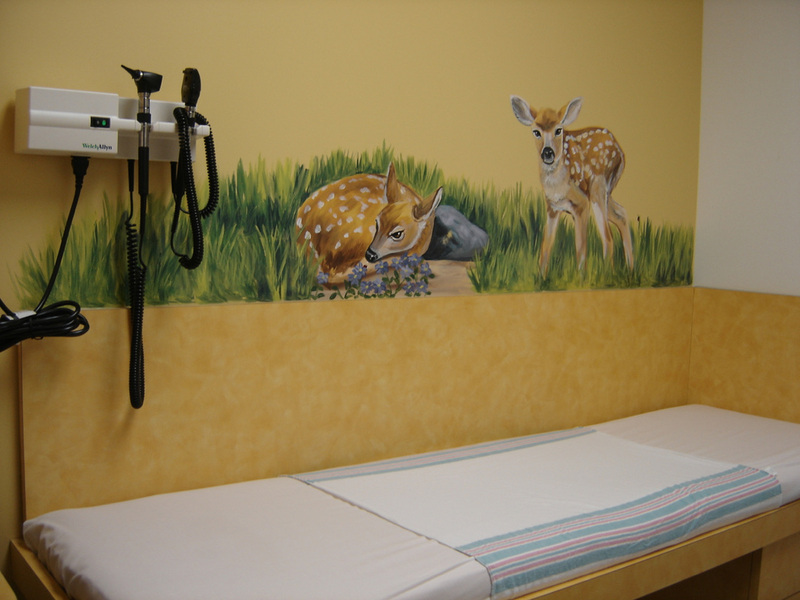 After painting the ASK Pediatric Hematology and Oncology Clinic at VCU Health System, Colleen was selected to transform the whole Pediatric floor with paintings on panel. 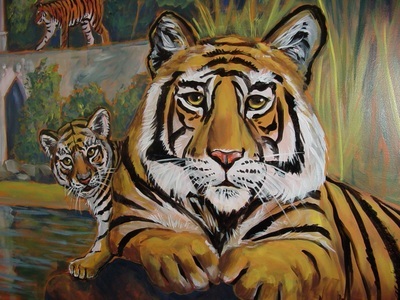 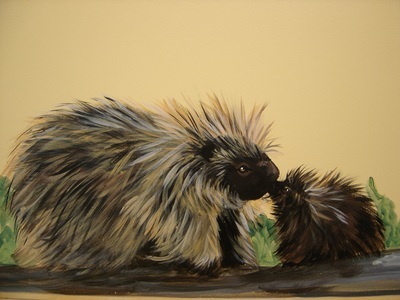 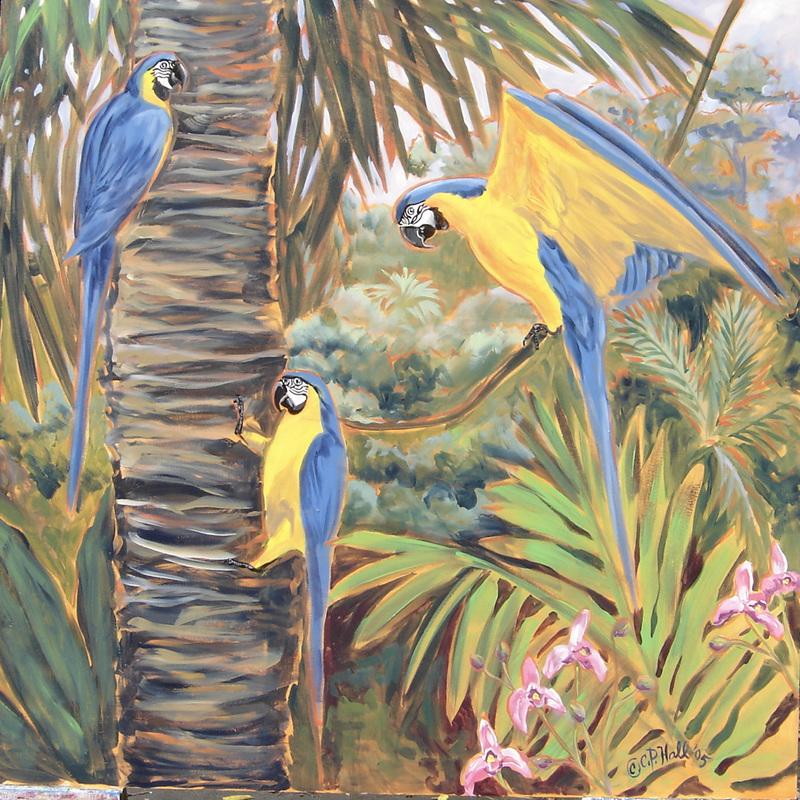 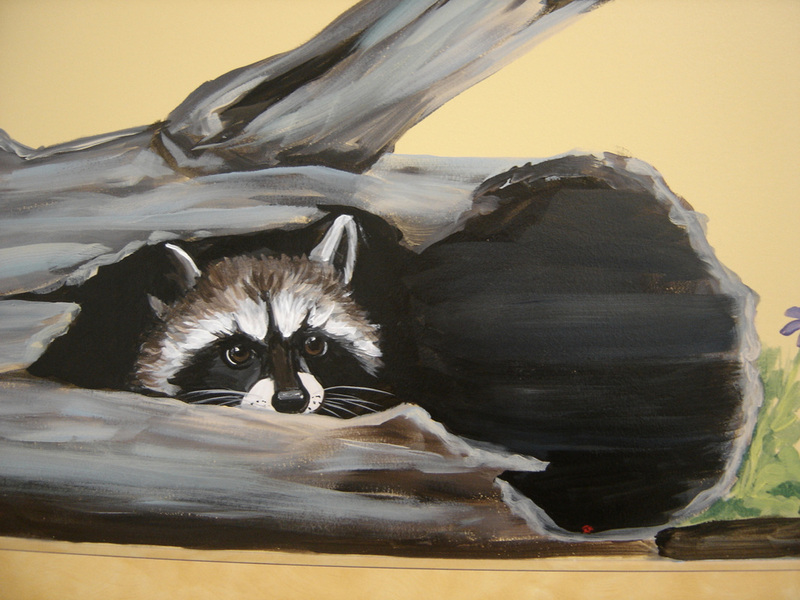 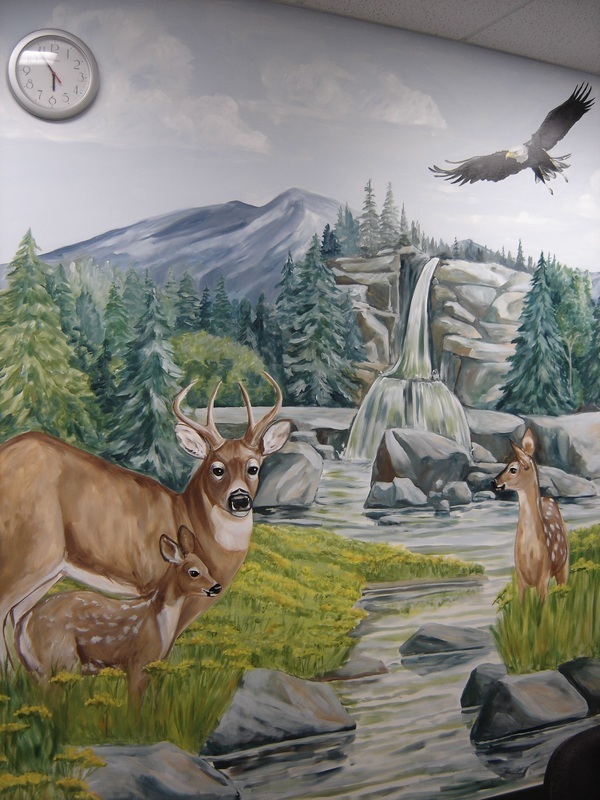 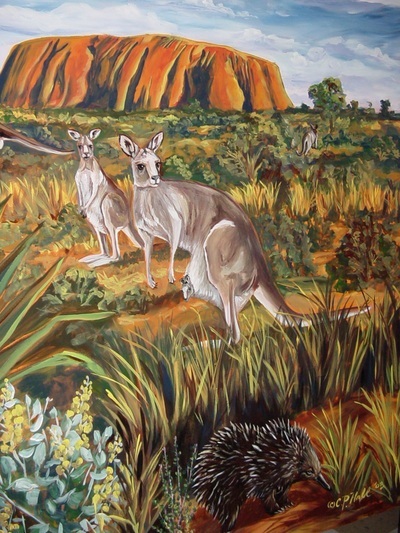 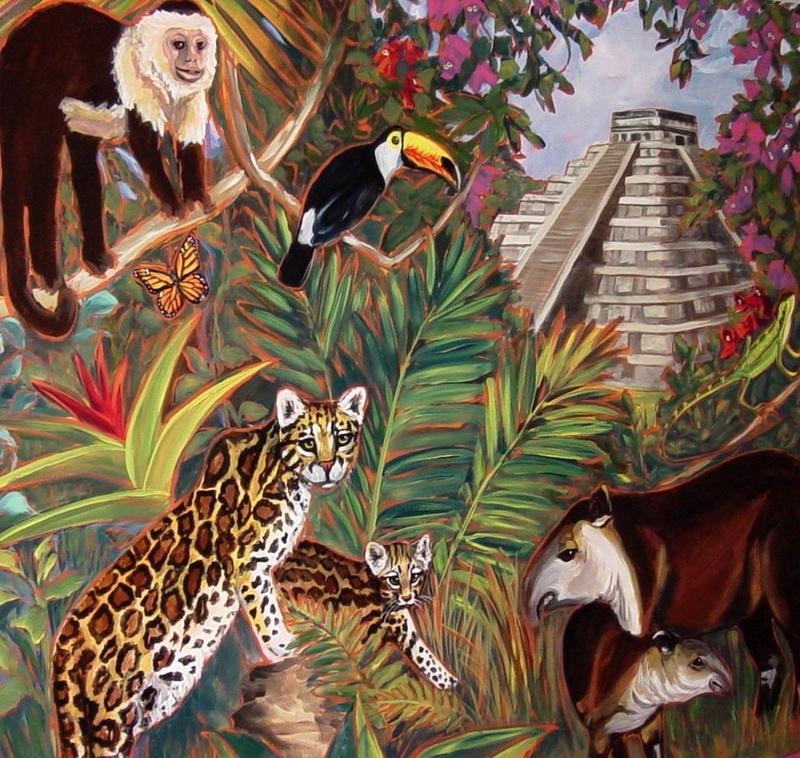 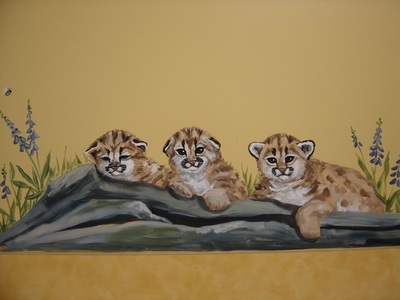 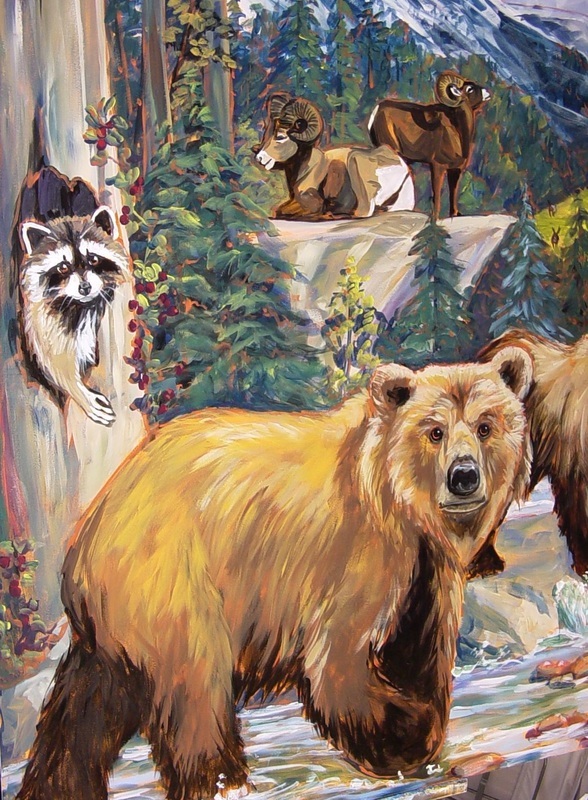 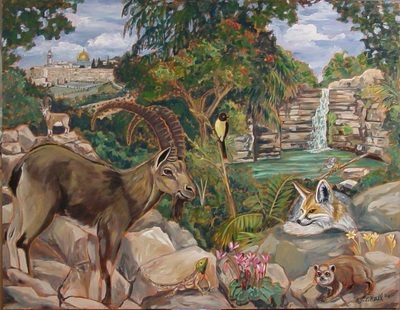 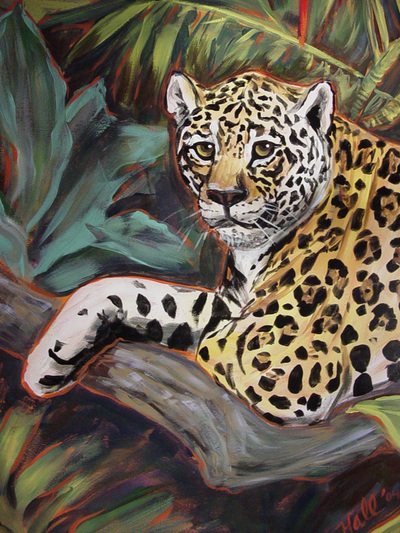 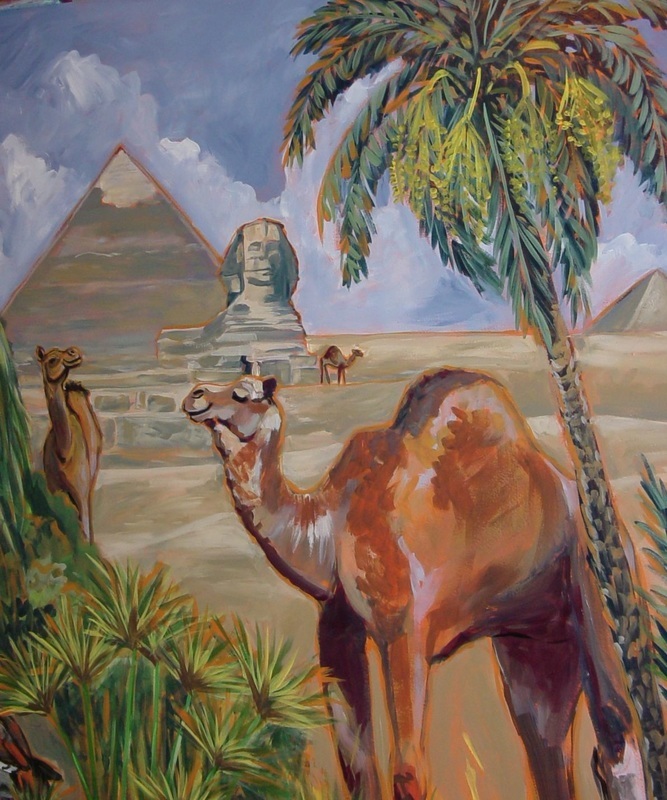 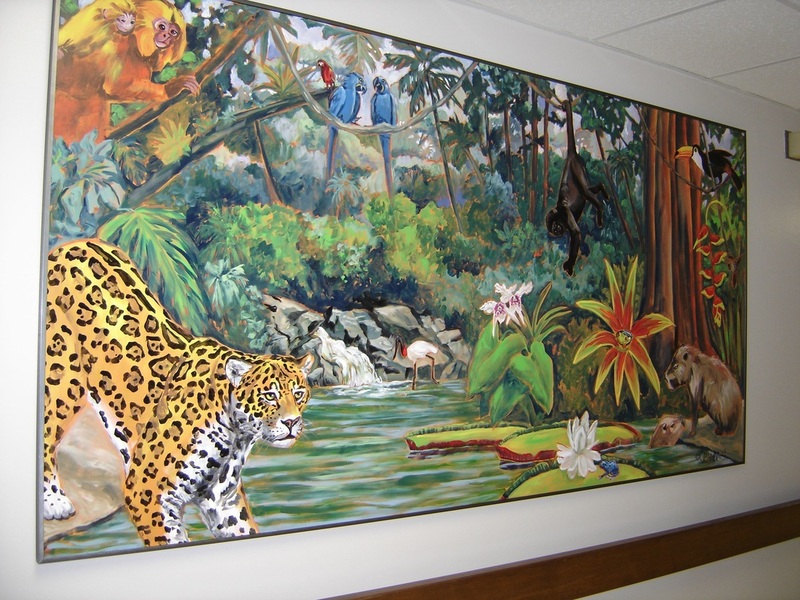 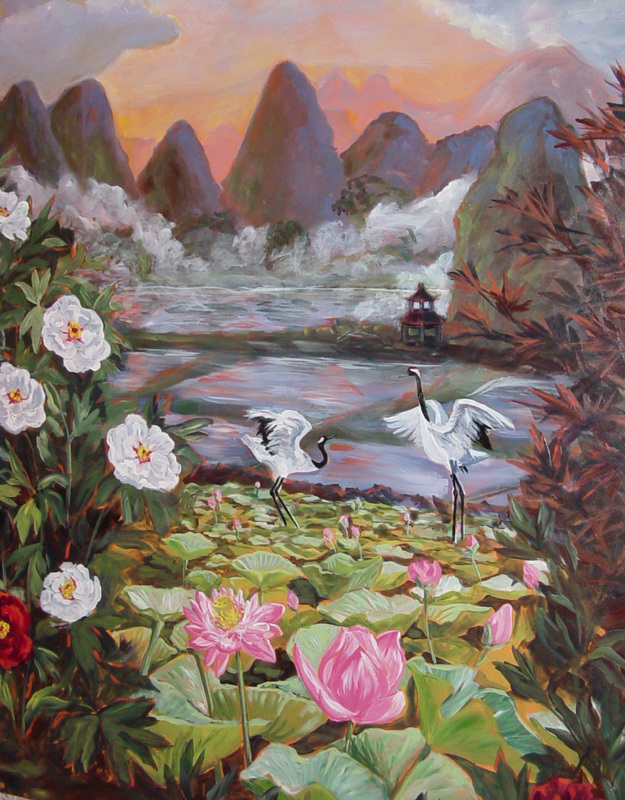 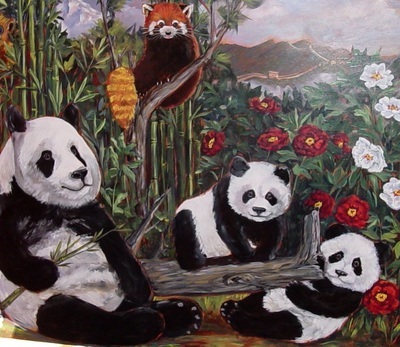 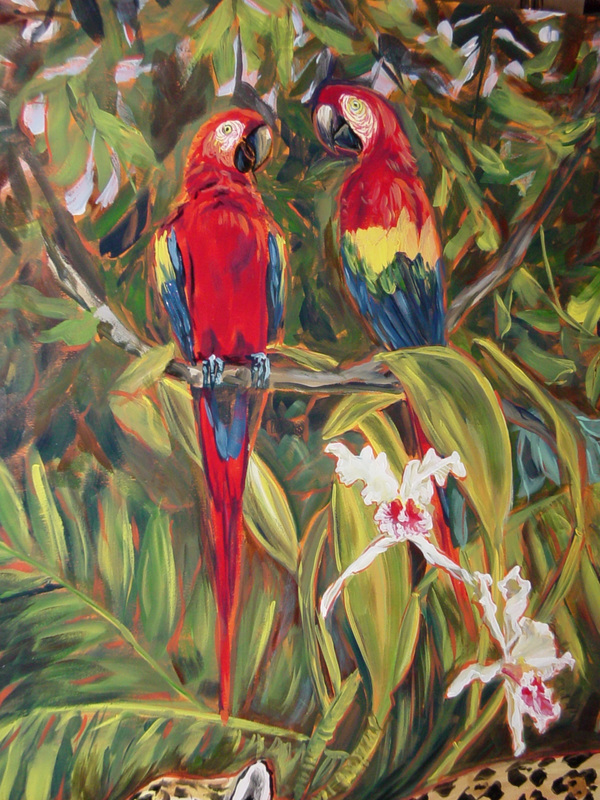 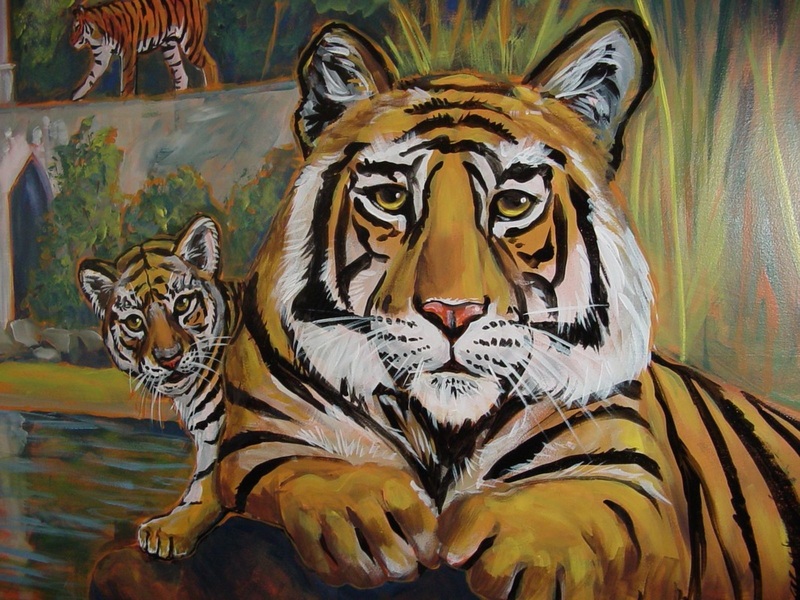 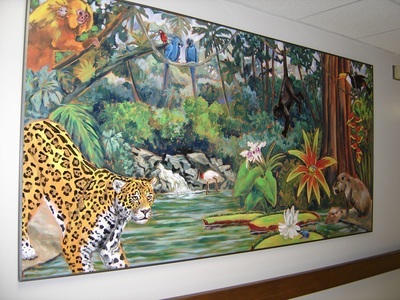 Colleen decided to offer the patients, parents, and staff a virtual world tour by creating paintings of exotic wildlife and landscapes. The panels ranged from the lush jungles of Brazil, Mexico and Indonesia to the Tanzanian Savannah and Outback of Australia. 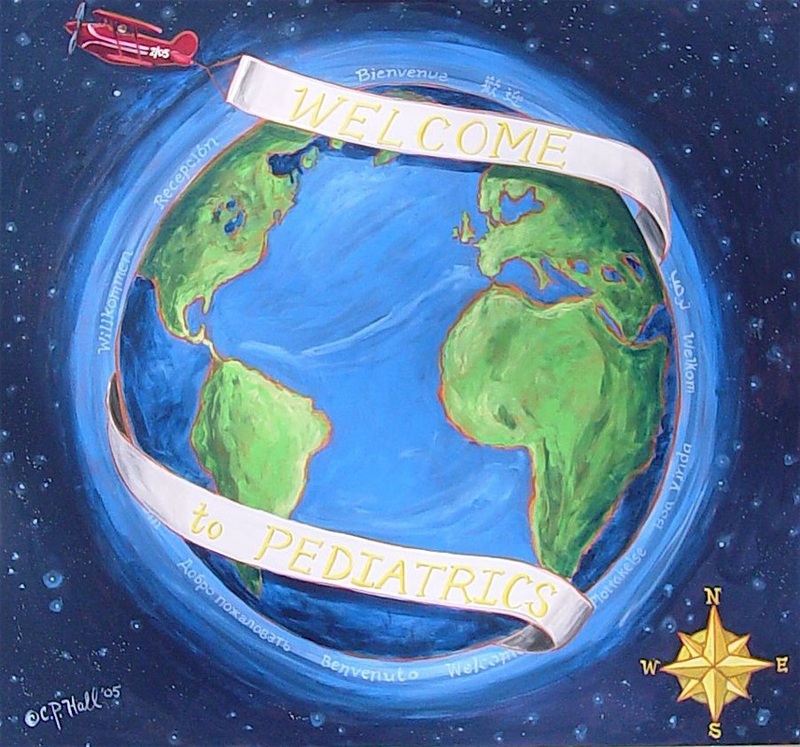 Colleen even created a paper passport for the patients who wanted to learn more. Colleen felt honored to be asked to design the third and newest office for this Pediatric practice. 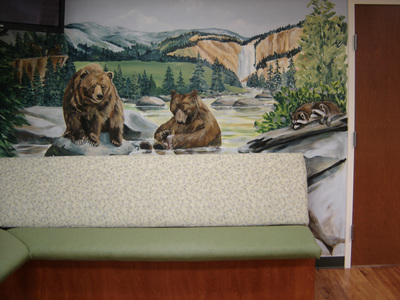 Always hoping to weave in education to the kids (and parents) waiting, Colleen came up with a National Park theme highlighting Yosemite and Yellowstone National Parks. 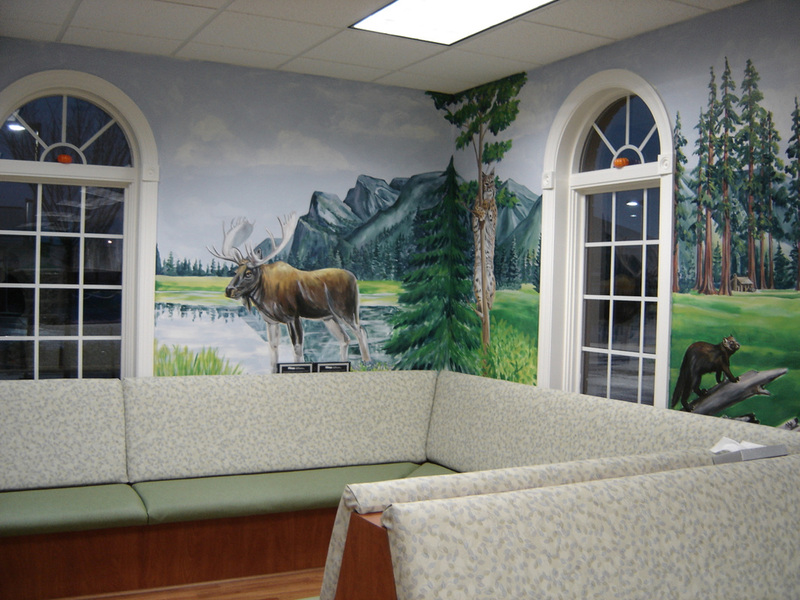 Again, she carefully researched which kinds of wildlife and unique features belonged on each side of the waiting areas. 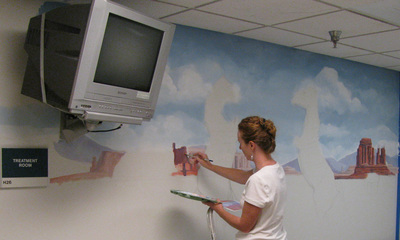 She then carried those themes down the halls and even into each exam room and lab waiting areas. 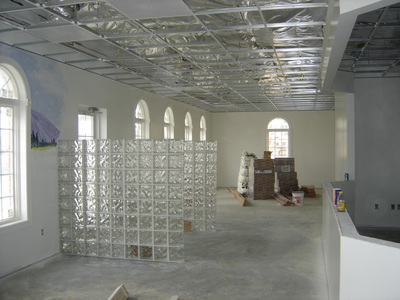 This comprehensive project provided so many details to explore that there is always something new to see. 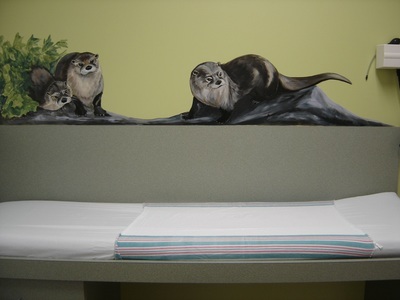 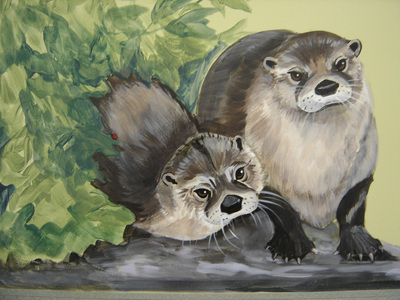 Colleen is all about function, so the animals painted over exam tables became sneaky elements of distraction for the children so doctors could draw their attention to the cute otter while doing the exam! 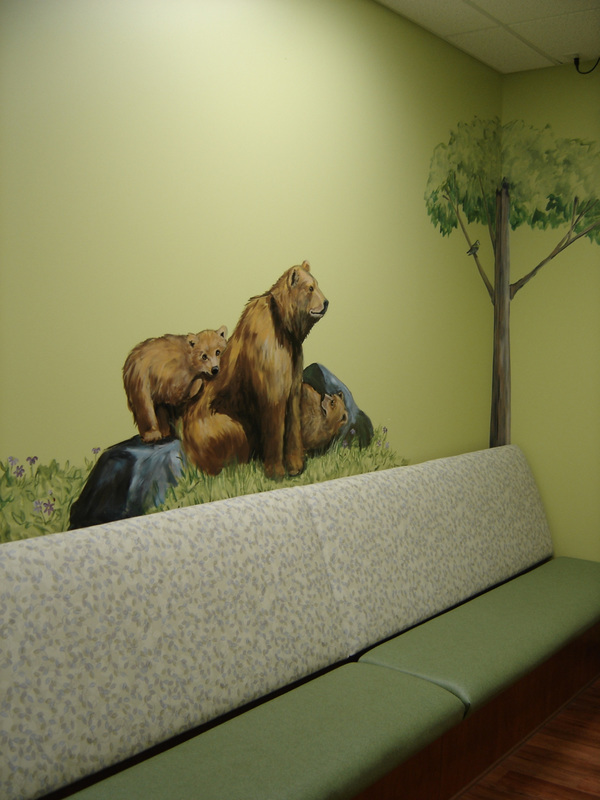 Small details like multiple ladybugs hidden around the rooms helped parents keep kids busy counting ladybugs while waiting for the docs to arrive. 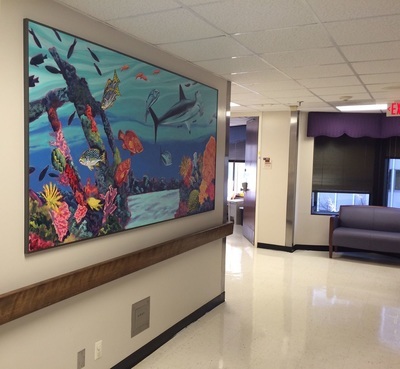 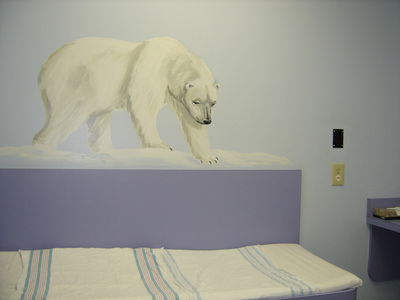 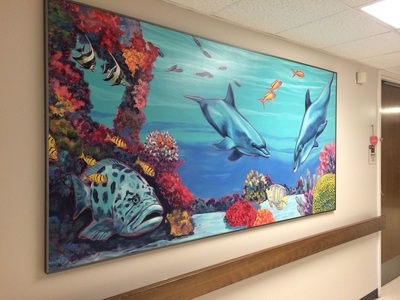 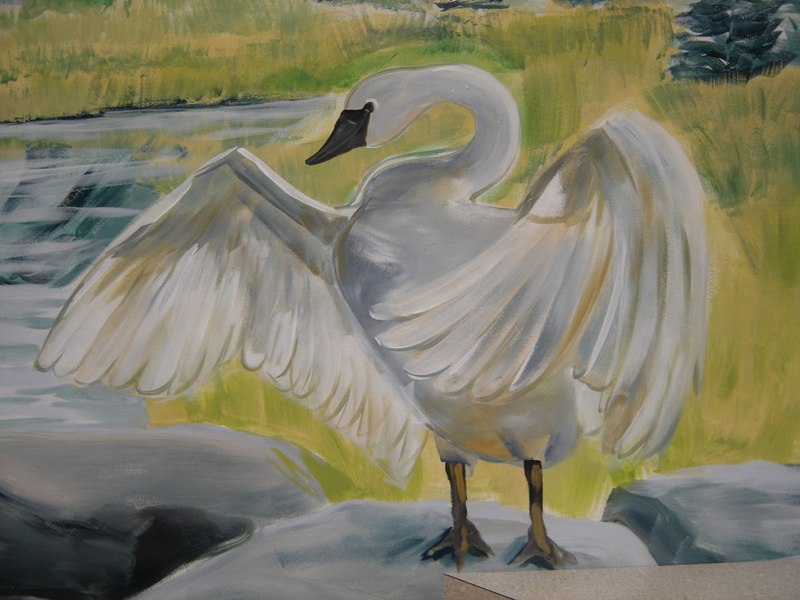 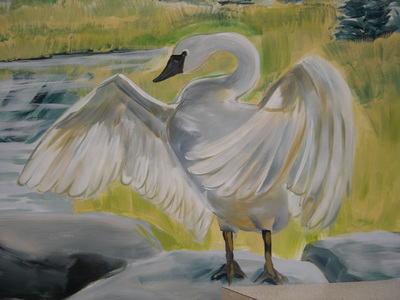 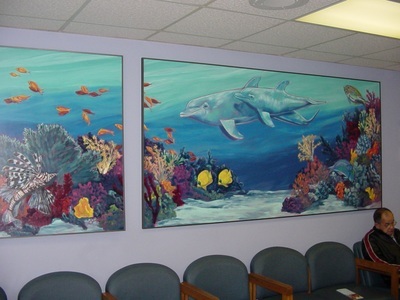 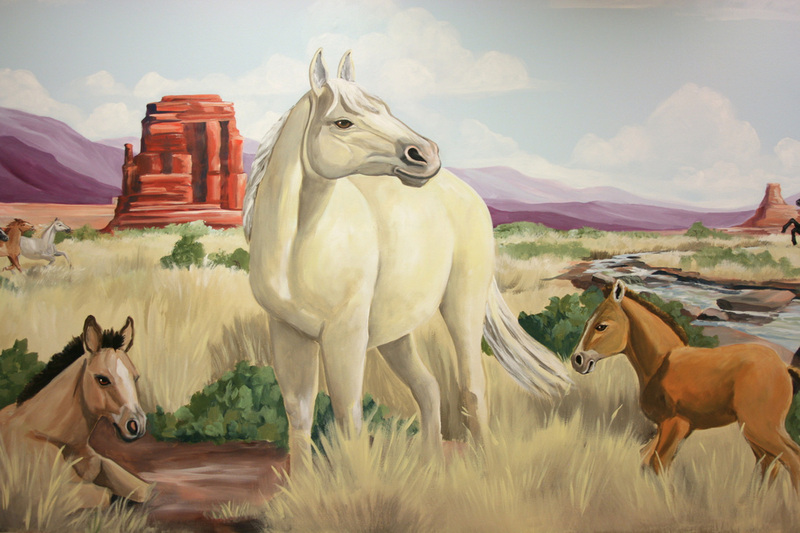 After completing the 7th floor project, Colleen was thrilled to be commissioned to complete a large series of paintings for the Children's Pavilion Clinic spaces. 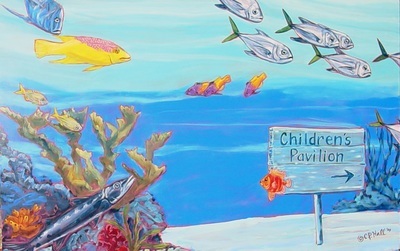 From signage that welcomes visitors from the parking garage to a virtual tour of the world's most beautiful underwater environments. Colleen highlighted the wonders of the oceans such as the Great Barrier Reef off of Australia, the Red Sea and the Kelp forests off of the coast of California. 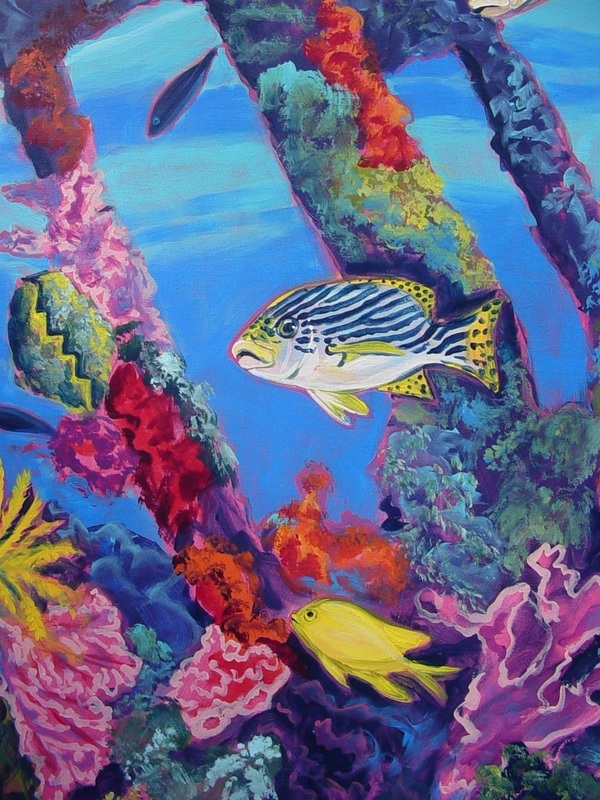 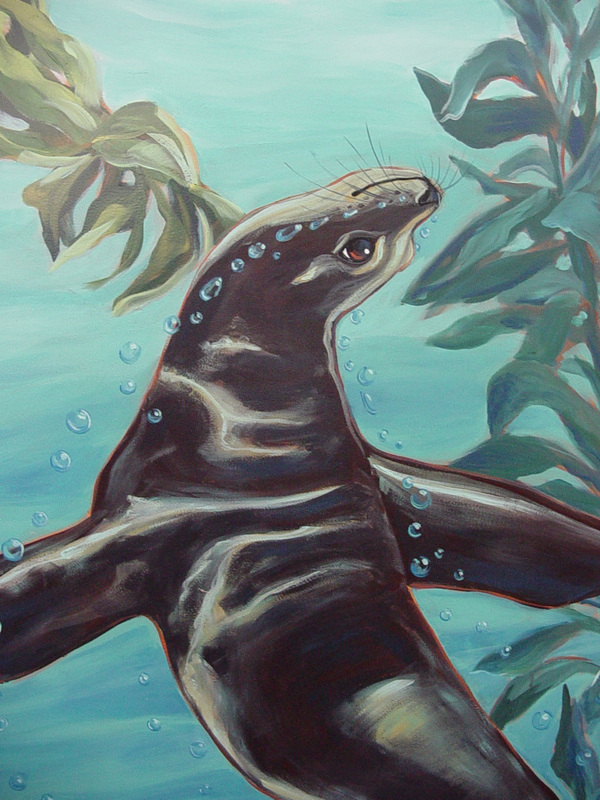 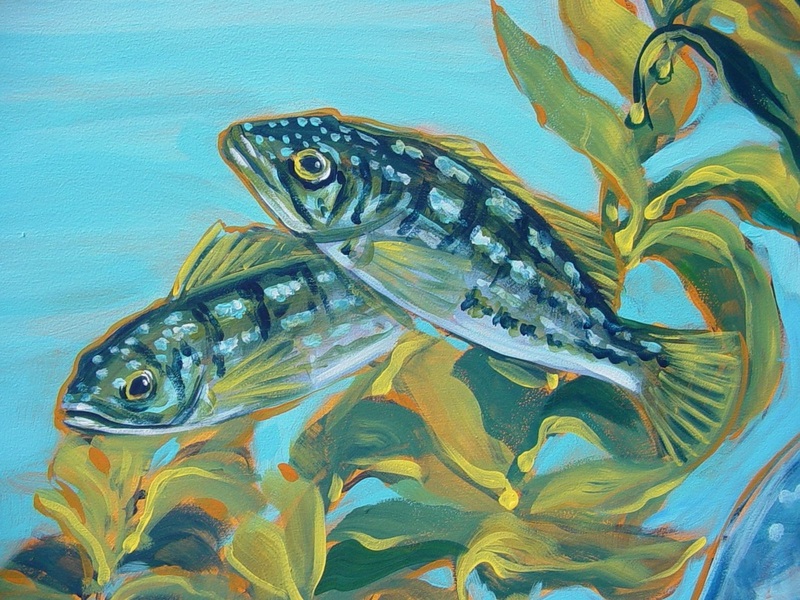 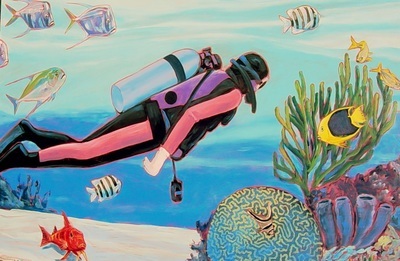 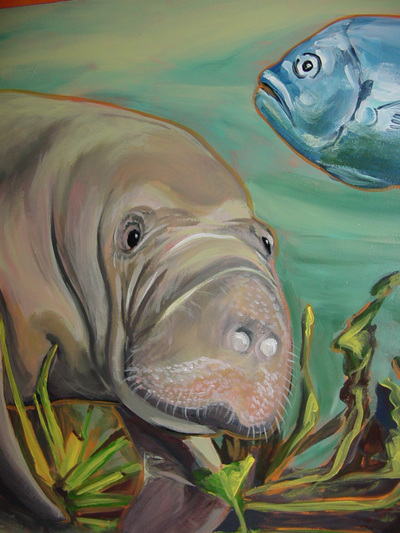 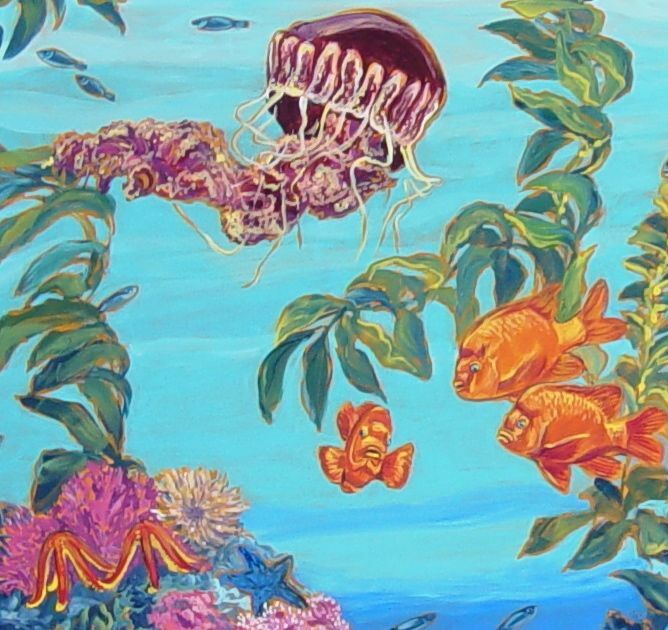 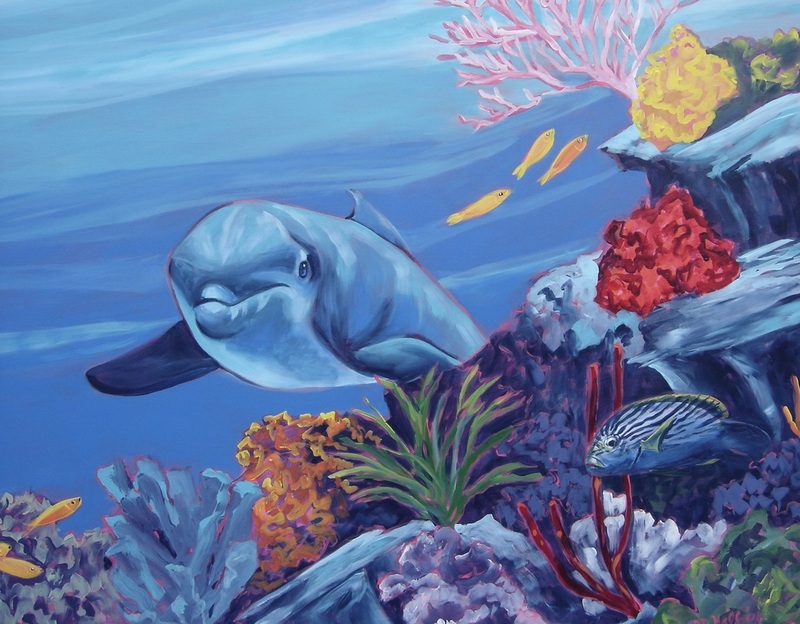 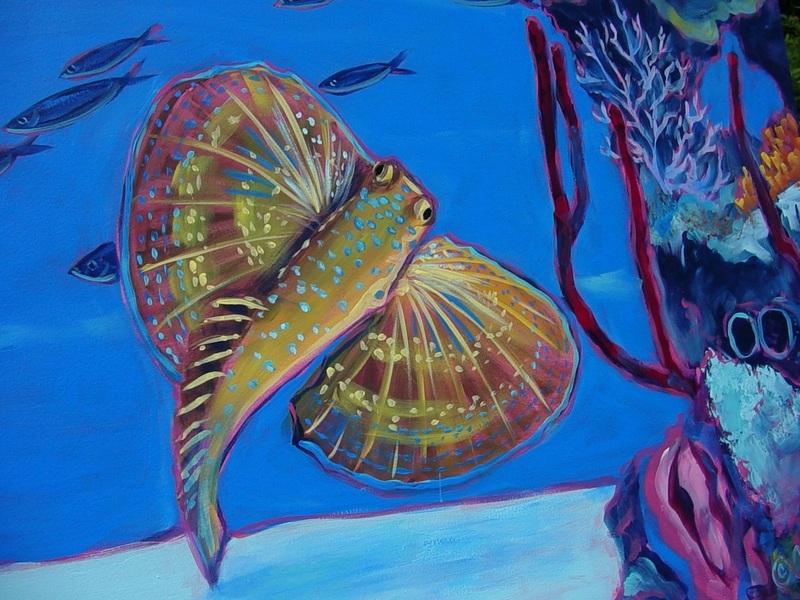 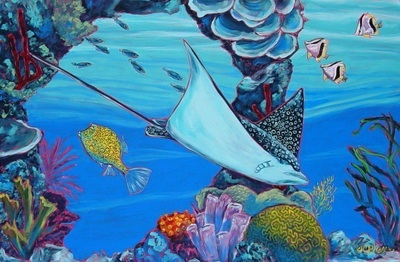 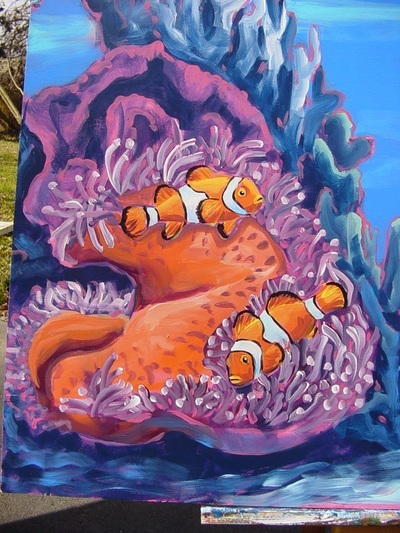 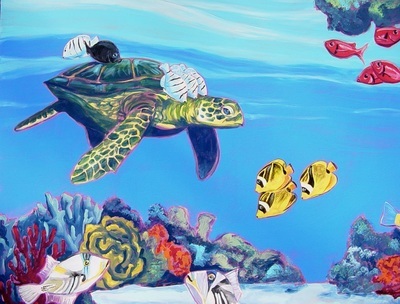 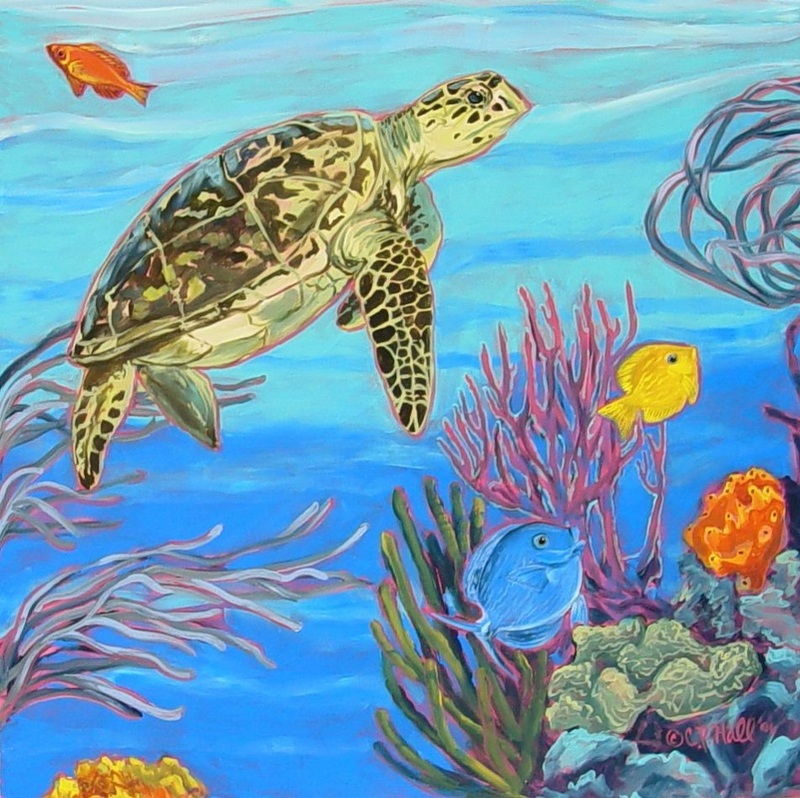 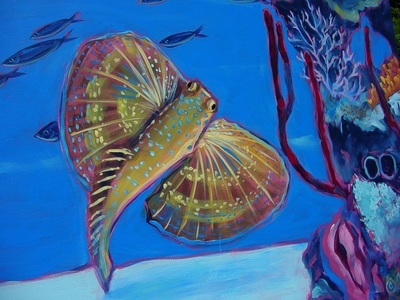 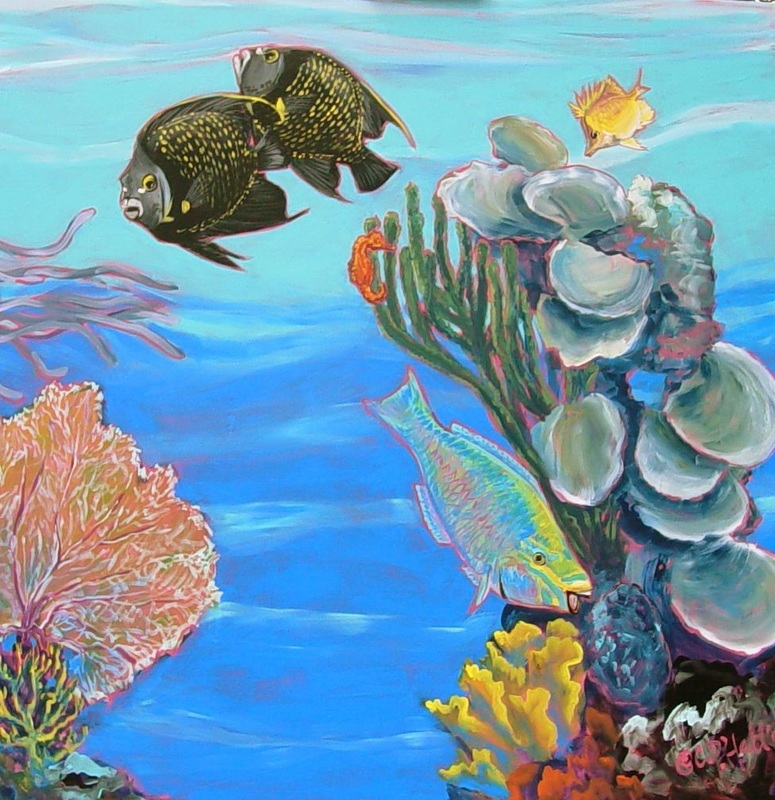 Each underwater landscape was researched for the proper fish and vegetation. 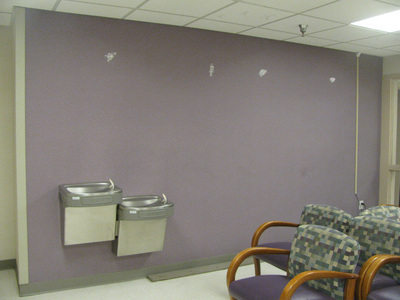 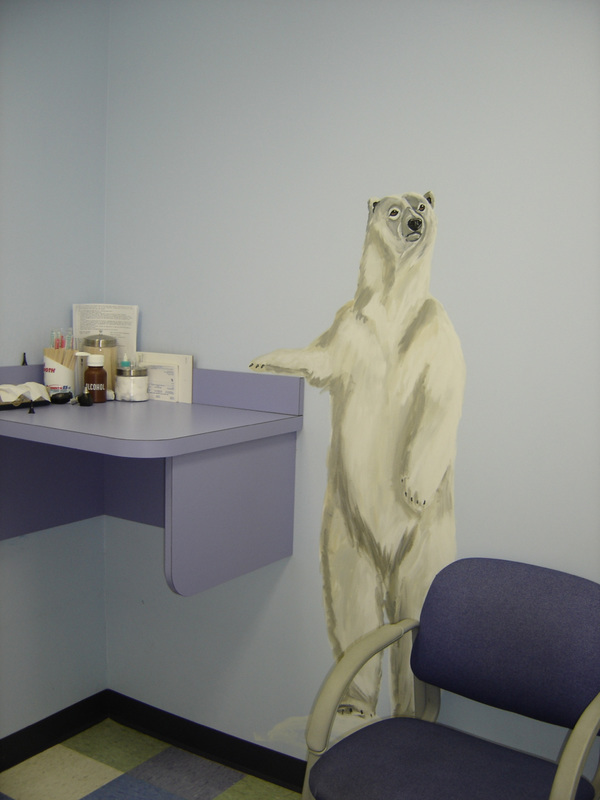 In her second office for this large pediatric practice, Colleen was inspired by a palette of purples, blues and greens. 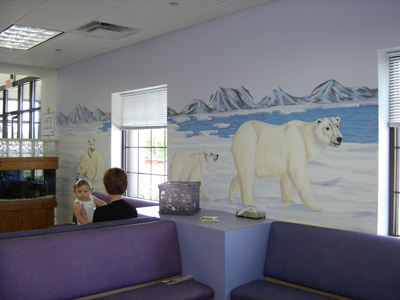 She came up with the concept of an Arctic/Antarctic theme where the waiting area (Sick and Well) would be divided up according to the North and South Pole environments. Like always, she sought to sneak in a little education making sure the kids and parents saw clearly that the Polar Bears were not hanging out with the Penguins! 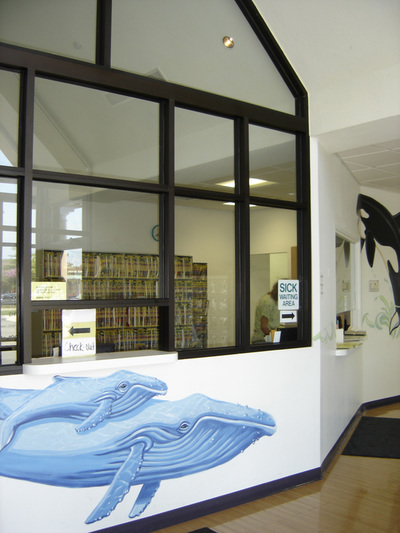 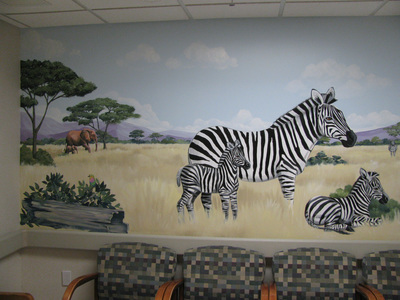 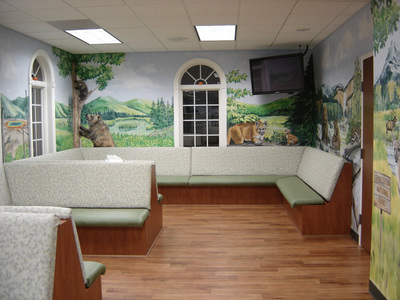 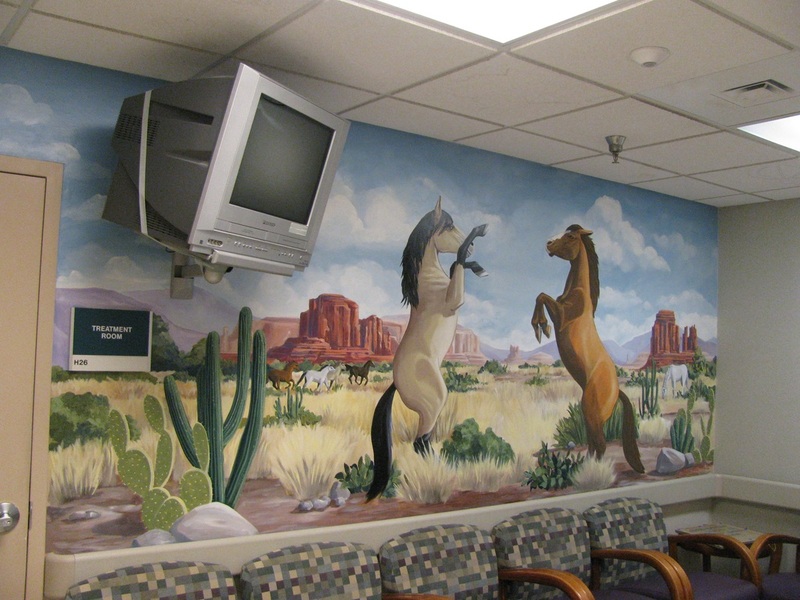 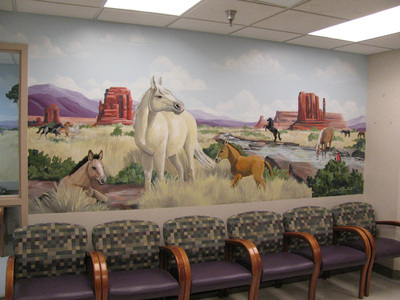 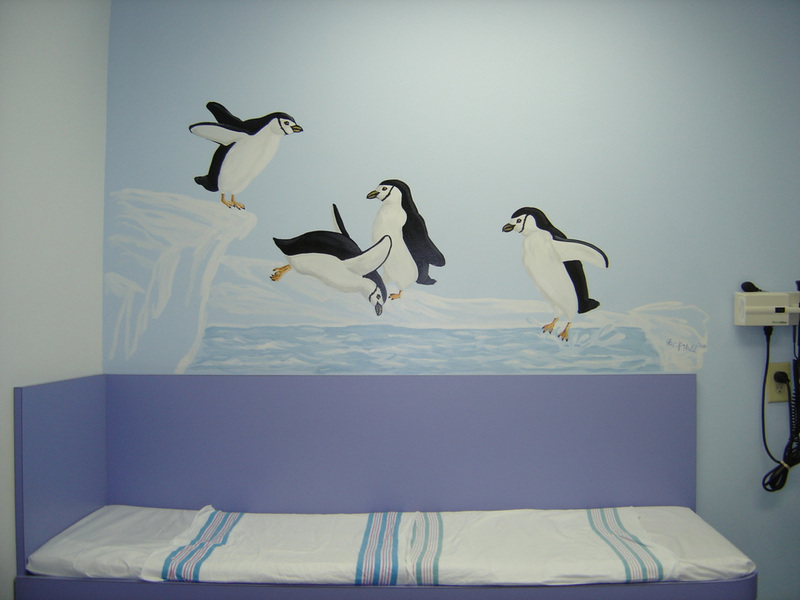 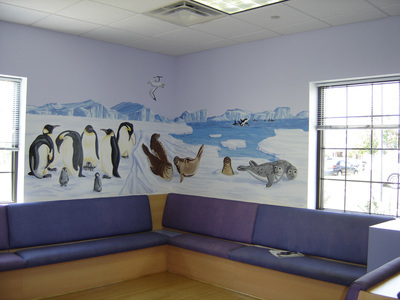 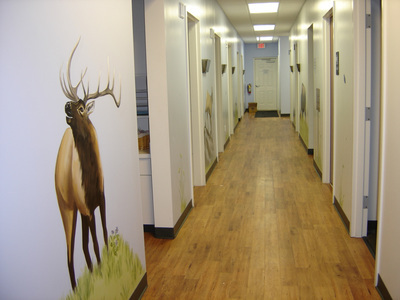 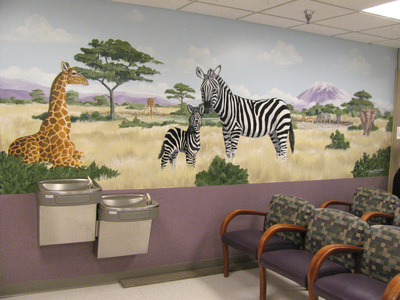 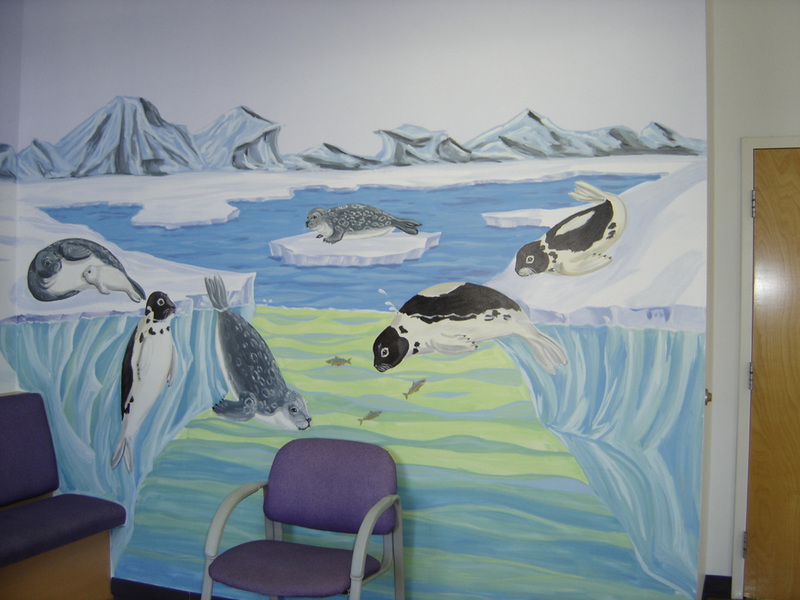 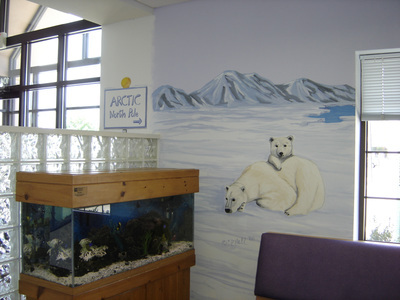 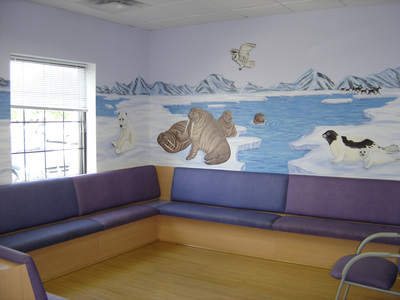 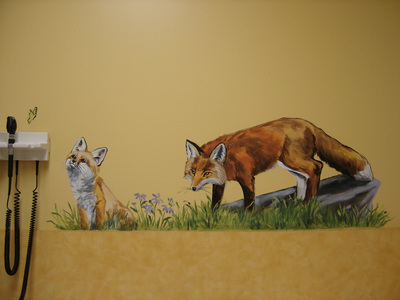 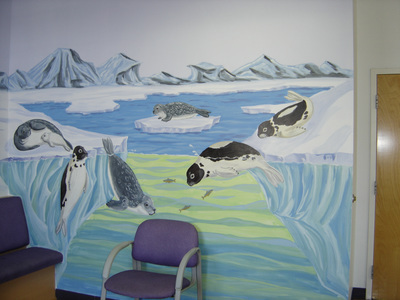 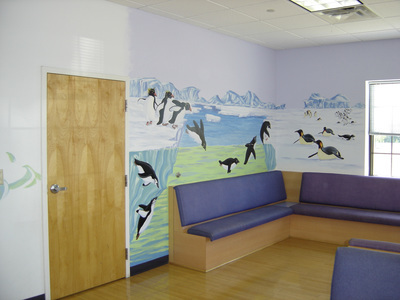 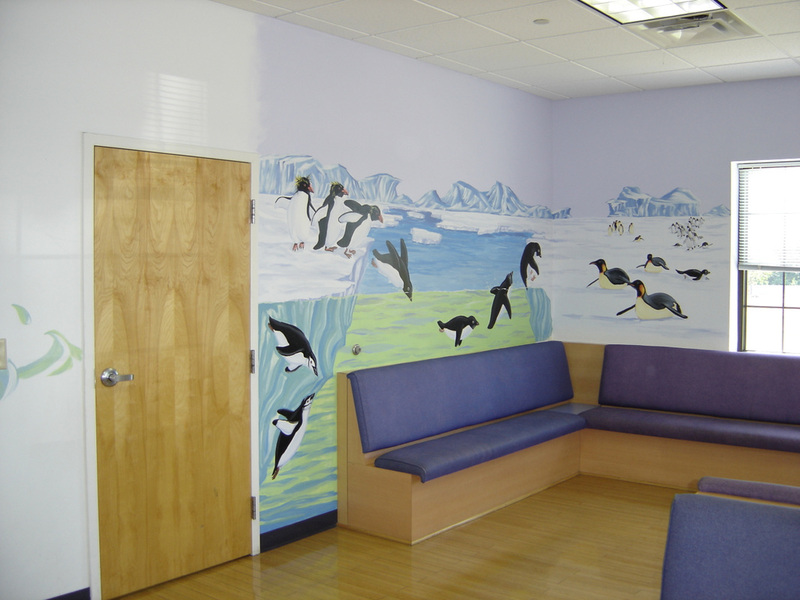 The project extended into the exam rooms where playful animals could greet and entertain the patients.